If you’ve been thinking about decorating this weekend and are struggling to find inspiration, fear not. We have put together eight of the best home decor trends for 2018. So whether you are decorating a living space, kitchen, bathroom or child’s bedroom, if you’re looking to be inspired, read on for some great home decor trends. Last year the top home decor trends included light Scandi-style woods and a minimalist look that some loved and others couldn’t wait to get rid of. This year the focus is on a lush and distinct look, but that minimalist vibe is still sticking around. Expect to see more retro tones, with a new twist on modern luxury. Straight lines with thin metallic supporting legs but quality craftsmanship are the stand-out features. There will be little added extra finishing touches to add a glamorous element. Grey featured heavily last year but for 2018 the scene is set for an injection of colour, albeit a subtle one. Think mustards, moss greens, dusky blues, muted jades and soft beiges. This goes for both furnishings and furniture, so match these muted colours with woods that have a warmer hue, such as cedar and pine and metallics like rose gold and bronze. The Pantene Colour of the Year is UltraViolet, so the perfect colours to add to this moody selection are soft lilacs, light pinks and dusky purples. Can a pineapple really feature in a list of top home decor trends for 2018? Evidently so. Think of it more as a motif rather than a trend to cover your whole house. Let it pop up here and there. For example, the best places are the bathroom, where you can use it in mirror form, or as a fun wallpaper print for a bedroom. If you have trouble envisaging how a pineapple can work as a décor trend, remember that last year we had the cactus popping up all over our homes. Interiors will be influenced from overseas as we see exotic and ancient prints from the Middle East, in muted colours that utilise all kinds of fabrics. From the highly decorated palaces of India to the dusty terracotta streets where ochre and clay colours rule. Think about raw elements that are tactile and have rough features, combined with very natural colours. Then add artisan prints such as Ikat in contrasting shades to brighten up the clay and beiges. When we talk about marble as one of our top home decor trends this includes the colours and tones of marble. Look for the palest greys, softest pinks that shimmer, silvery tones, rose golds and the lightest moss greens. Once you have chosen your colour schemes you can then decide on textures. Obviously, actual marble works well in bathrooms and kitchens, but marble also gives an elegant touch in living and bedrooms. If you can’t afford to go full-on with this trend, look for accessories such as lamps with a marble effect, or wallpaper and cushions with a marble pattern. Using botanical prints in your home is a great way of bringing the lush outdoors inside. You can go big and bold with bright green colours and prints of lush rubber plants, ferns, leaves and fronds. Or why not go down the floral route with delightful bugs and butterflies against a botanical background, with pretty flora and fauna to compliment? Use lighting that either has some connection to the past or looks old-fashioned. There are some great new versions of old-style lighting in the stores today. 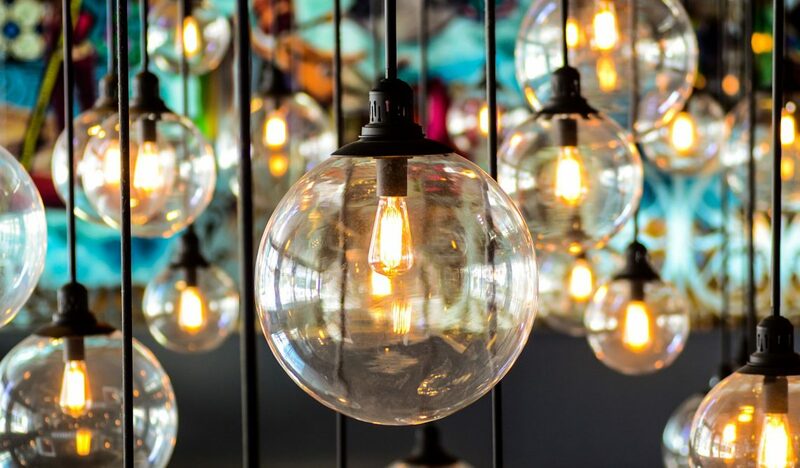 Our favourites include lamps with wire-encased bulbs and industrial-style hanging ceiling lamps. Finally, where fashion leads, interior trends often follow, and this is true of our last category – fringing. Certainly not for the faint-hearted, you’ll start to see fringing everywhere this spring on clothes, bags, sandals, you name it. So how do you incorporate it into the home? It’s not as difficult as you’d imagine. You can get fringing on loads of accessories including lamps, cushions, hanging wall features, furniture, and would you believe, even wallpaper!